Scrum is a popular agile software development method based on sprints, regular reviews, and iterative improvement. In particular, it democratizes things with its feedback loops and transparent decision-making. Typically, scrum is only used to develop software. But I think that's a shame. The things that make scrum work for software development can also work in other contexts. We have had a lot of success at Crate.io applying scrum-like principals to other areas of the business. And in fact, we regularly invite everyone at the company to participate in organization-level retrospectives, discussion, and planning. I want to share one of those success stories with you. 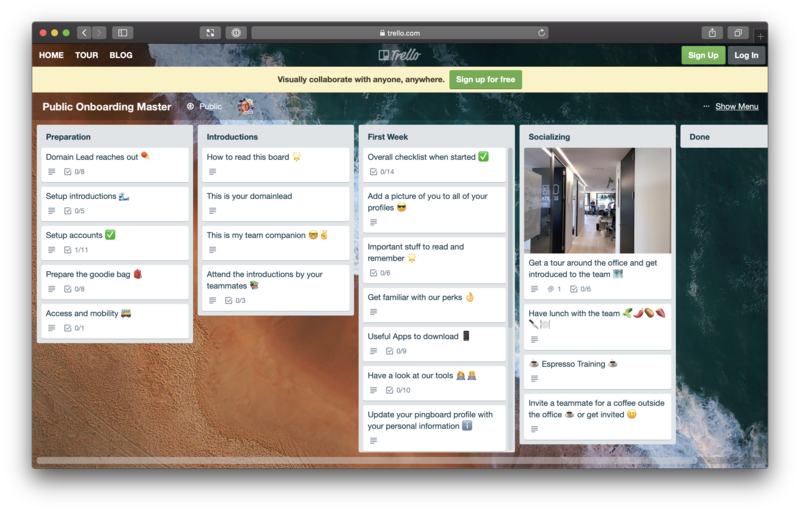 In this post, I explain how and why we started using Trello to improve the onboarding experience for our new employees. We've been doing this for a while now. So, nothing new. Every step is mandatory, except step four. However, step four isn't just for programmers. Tasks can be useful in a variety of different contexts. We do not set tasks that should take more than a couple of hours. Companies that set longer tasks are effectively filtering candidates by on how much free time they have—which we think is an unfairly discriminatory practice. Our goal with step four is that it is mutually beneficial. We get an impression of your working style, and you get an impression of the working environment. In fact, we try to limit the whole process to two to four weeks in total with important feedback given as soon as possible. If you accept our offer, fantastic! We agree on a start date, and that's that. And, in the past, this is where the hiring process ended. And it was then up to that person's line manager to determine what came after. Which worked for a while. But as our company grew, we started to notice inconsistencies and issues with the new hire experience. So we started to formalize a secondary procedure: the onboarding procedure. Some new hires were not given starter tasks or did otherwise not have a great introductory experience. Expectations and responsibilities were not always communicated consistently or in full. Some new hires (especially remote workers) were unsure of other people's roles, how they fit into the organization, and so on. We figured these issues amount to inconsistencies resulting from the fact that there was no standard onboarding procedure to follow. So, we needed to come up with an onboarding procedure. We were already using Trello for other aspects of the business. And after some experimentation, we realized a good approach would be to create a template Trello board that can be copied for each new hire. You can access a copy of this yourself: Onboarding Master. And if you're signed in, you can select Show Menu, More, then Copy Board to copy this board over to your account. As you can see, we have four primary columns and one done column. An existing member of staff completes the cards in the Preparation column and moves them to the Done column. The new hire starts by reading the cards in the Introductions column, moving them to Done when they're done. These cards introduce you to the board and to your domain lead and team companion. The new hire works on the First Week and Socializing columns, moving cards to the Done column when they're done. These cards try to make sure that you get a comprehensive introduction to the company, the work environment, processes, and your colleagues. Let's look at those columns in more detail. This column has cards relating to the preparatory work that needs to be completed before a new employee starts. Every employee is an integral part of the team, and we want to make sure that our actions communicate this. That's why the preparation that is done before a new employee starts is arguably the most crucial part of the onboard procedure. Get in touch and make introductions. Set up the Introductions column. Set up all the necessary IT accounts before the first day at work, so everything is ready to go. Make sure the employee's physical space is prepared. This includes provisioning new IT equipment, a desk, and so on. Put together a goodie bag (with the sorts of swag you might get at a conference). A card that introduces the purpose of the board and how to work with it during your first couple of weeks. A card that provides useful information about your assigned domain lead. Teams are formed around specific timeboxed projects that typically last two months. So you can expect to change teams as often as that. We have found that this ensures everyone at the company gets a rounded experience working with different people and on different parts of the product. Separate from this, your domain lead is responsible for your personal and professional development at the company. Your domain lead is not usually involved in your day-to-day work, but they are your first port of call if you have any issues, questions, or requests throughout your employment. A card that introduces the new employee to their work companion. Your work companion is a peer who is assigned to you for the first couple of months of your employment. They will show you the ropes and make sure that your initial day-to-day is going smoothly. If you are working out of a specific office, your work companion is likely to be based at the same location. Between them, your domain lead and your work companion will guide you and make sure you know what's what. This column has cards with initial tasks for the new employee. Generally, we expect it is possible to complete them all in the first week. We have a standard set of cards that are assigned to all new employees. But it's also common for a domain lead to add additional cards that are specific to the role being filled. One of the most important things we want to make sure is done during this first week is the establishment of mutual expectations. This forms the basis of a healthy and productive relationship! Finally, this column suggests activities that will hopefully help the new employee feel more at home. This is particularly important for us because we're a remote-first company. That is, we assume remote work is the default. So a concerted effort must be made to include people who might not be physically present a lot of the time. Have you had an office tour and have you been introduced to the different people working in the office? Have you been for lunch with your coworkers yet? Do you know how to work the coffee machine? Do you know what else is happening soon? Depending on your location, we do things like cooking, daytime workshops (e.g., bread making), snowboarding, bouldering, escape rooms, go-karting and so on. Hopefully, by the time all of the cards end up in the done column, you will have already been assigned to an additional, team-specific Trello board and your regular day-to-day work will be underway. In this post, I showed you how we use Trello at Crate.io to improve the onboarding experience for our new employees. We've used this approach multiple times now. And, so far, feedback has been very positive. Don't forget to check out the public version of our template board. Setting up a Trello board means that people can copy it every time we hire a new person, And one of the best things about Trello is that it's so adaptable, which makes it easy to listen to feedback and iteratively improve the process. Also, this starter Trello board serves as a neat introduction to the way we communicate and collaborate asynchronously across multiple offices with multiple remote workers.